At the Mystic Supper, when the apostles grieved over their forthcoming parting with their Divine Teacher, He offered them a comforting promise: “I shall not abandon you”… “And I will pray the Father, and He shall give you another Comforter, that He may abide with you forever, even the Spirit of truth” (John 14:16). “He shall teach you all things and bring all things to your remembrance, whatsoever I have said unto you” (John 14:26). And this promise the Lord fulfilled 10 days after His ascension, on the 50th day after His glorious Resurrection from the dead. The promised Comforter, the Holy Spirit, descended upon the apostles, and from this moment there appeared on earth the “Kingdom of God come in power,” of which the Lord spoke many times before, – the Church of Christ, which is nothing less than a treasury of grace of the Holy Spirit Who continuously resides in it. This is why the Holy Fathers often call the day of the Pentecost – the birthday of the Church of Christ, the establishment of which Christ had promised during His life on earth, saying: “I will build My church, and the gates of hell shall not prevail against it” (Matt. 16:18). Why is the Church needed? The Church is like a ship, which carries us to the quiet harbor of an eternal life of bliss, saving us from drowning in the tempestuous waves of the sea of life and steered by a wondrous and most-wise Helmsman – the Holy Spirit. The Church of Christ is the Kingdom of the Holy Spirit. The Spirit of God invariably resides in the true Church of Christ and spiritualizes it, filling the souls of all the faithful. This is why the day of the Pentecost, which is called the final and concluding feast among all the other Christian holidays, is so great and glorious. Great and glorious is the feast of Christ’s Nativity, incomparable is the glory of the “feast of feasts and celebration of celebrations” of the most-glorious Resurrection of Christ, but neither the one nor the other would have been of benefit to us, had not the Holy Spirit descended on the day of the Pentecost. On this day, the descent of the Holy Spirit concluded God’s entire majestic project of the salvation of fallen mankind from sin, damnation, and death. 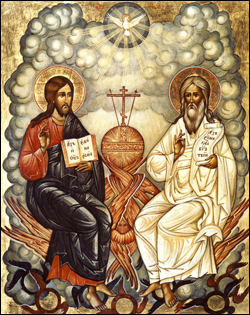 And all three Persons of the Most-holy Trinity – the Father, the Son, and the Holy Spirit, – took part in this affair. Therefore, on this day we not only celebrate the Holy Spirit, Whose descent is commemorated, but likewise the entire Trinity – One-in-essence and Indivisible, and this feast is usually called Trinity Day. “For that which God the Father was pleased to grant, that which the Son of God executed, the Holy Spirit descended to accord to the faithful,” – teaches us our native theologian, St. Theophanus the Recluse. For this reason, whoever wishes to make use of the grace-filled resources that are requisite for our spiritual renaissance, – for in this lies the essence of Christianity: to become a new creation, – must belong to the Church, but to the genuine Church of course, and not to some organization created by men and simply calling itself a “church,” of which there are many now. Without the grace of God that is granted only within the true Church, spiritual regeneration is impossible, and so is eternal salvation. Such an opinion, of course, radically contradicts the teaching of the Word of God, which clearly says: “That all may be one” (John 17:11); “One Lord, one faith” (Eph. 4:5); “Be ye of one accord, of one mind” (Phil. 2:2). This appeal to Christians to be of one accord and one mind in the Church runs like a thread through the entire Holy Writ, for what “church” can there be where each person thinks and feels “according to his own taste”! The Church is the “pillar and ground of Truth” (1 Tim. 3:15), and since there is only one Truth, there can also be only one true Church. It is to this one true Church, established by the Lord Jesus Christ Himself and consolidated by His holy apostles, that we must belong if we wish to inherit eternal salvation. However, we must belong to it not formally, but with all our soul, with all our inner being: we must live in the Church, earnestly fulfilling all its instructions and accepting its grace-filled sacraments, which were instituted for our spiritual purification and regeneration, and for the renewal of our sinful and fallen human nature. The one true Church to which we must belong and in which we must live for our salvation is the Orthodox Church, which has sacredly and indestructibly retained for almost 20 centuries the dogmatic and moral teaching of the Gospel and the entire canonical structure based upon the Gospel teaching. The fact that this is so is confirmed precisely by the accusations that are thrown at this Church, that it has supposedly become “petrified,” that it “opposes progress,” that it “does not wish to go along with the times.” All these accusations actually comprise the greatest praise for it as the one true Church, immutable guardian of all that was taught by Christ and His disciples, His holy apostles. But in our times, especially after the fall of Orthodox Russia, destroyed by the enemies of Christianity, the terrifying symptoms of apostasy, i.e. abandonment of the true faith, have appeared also in the Orthodox Church. These include all manner of willfulness, freethinking, rationalism, liberalism, and modernism, which have finally led autonomous Orthodox churches to so-called “ecumenism,” whose objective is to “unite” all religions and all church branches without their internal unification, without that accord and unity of mind, to which the Word of God summons us. That is not unity in God, but in someone else, who must tightly unite everyone in complete subordination to himself. Thus will Christ’s adversary – the Antichrist – aspire to unite everyone in subordination to himself, as had been foretold by the Holy Fathers of the first centuries of Christianity. And now intense work is being done to corrupt the Orthodox Church from the inside, since it is the only true Church standing in the path of the Antichrist and hindering his attainment of his plans. Wherever dogmas waver, wherever the moral teaching of the Gospel and the Church’s canonical system that is built upon it is subverted, there we clearly see the work of the servants of the coming Antichrist, no matter what they call themselves or how they dress themselves up. The “gates of hell” shall not prevail against the Church, but they have prevailed and are fully capable of further prevailing against many who believe themselves to be pillars of the Church, as witnessed by Church history. “See then that ye walk circumspectly!” – the Word of God warned all Christians even back in apostolic times (Eph. 5:15). Should we not be even more obliged to remember and to constantly remind everyone of this apostolic warning in our own times, which have now become more “wicked” than ever before? In our present times, as we experience widespread corruption of all facets of modern life, a mockery of holiness, and constant sorrow from the prevalence of iniquity, we are especially in need of the grace-filled aid and comfort of the Holy Spirit, Who is sent to us by the providence of the Most-holy Trinity in the true Church of Christ.